Well, the Radmacher v Granatino case has certainly got family lawyers writing. No fewer than three articles about it appeared in Family Law Week this week (by David Hodson, Timothy Scott QC and David Burrows), and I received another one by email from Stour Chambers. It seems that there is nothing more likely than the subject of pre-nuptial agreements to provoke discussion amongst family lawyers. For those of you who have been out of the country since the 2nd July, the Court of Appeal in Radmacher decided that the court below had been wrong not to give 'decisive weight' to the pre-nuptial agreement that the parties had signed, when dealing with the husband's application for ancillary relief. "I would not accept that the genesis for the call for legislative provision for ante-nuptial contracts was the decision of the House in White v White. Nor would I accept that the seekers are the predominantly male super-rich, anxious to ensure that the contemplated marriage will not prove too expensive on its future dissolution. There are many instances in which mature couples, perhaps each contemplating a second marriage, wish to regulate the future enjoyment of their assets and perhaps to protect the interests of the children of the earlier marriages upon dissolution of a second marriage. They may not unreasonably seek that clarity before making the commitment to a second marriage. Due respect for adult autonomy suggests that, subject of course to proper safeguards, a carefully fashioned contract should be available as an alternative to the stress, anxieties and expense of a submission to the width of the judicial discretion." Clearly, the Court of Appeal envisages much wider use of pre-nuptial agreements in future. "England does now have a much greater likelihood that agreements freely and voluntarily entered into, perhaps even with one party choosing not to take legal advice, will be given some, probably considerable and even perhaps very substantial weight in the section 25 fairness criteria. The safety net [that the court will intervene if there was injustice] still exists but it is now narrower and certainly cannot be relied on in advance. The skills and care of the English family law practitioner in the context of marital and other domestic relationship agreements must now be greatly intensified and improved." A good point, I think: as the provision contained in a pre-nuptial agreement may well be all that the client will get on divorce, then surely the same level of care must be given to dealing with a pre-nuptial agreement as to dealing with a settlement on divorce. Inevitably, this will include full disclosure, a process that will involve a considerable amount of work and therefore mean that the costs will not be trivial: will people of modest means be prepared to pay those costs? Having said that, Timothy Scott QC points out (inter alia) that: "Neither lack of independent legal advice nor absence of full disclosure will necessarily deprive an agreement of value". "the decision of the Court only adds to the uncertainty that infinite discretion presents. The less the practitioner can guess which way a judge will jump, the more the case will cost because it is more difficult to settle. If the appeal could go a variety of ways as well, then why not keep the litigation going to see if a better answer emerges, a client may say?" 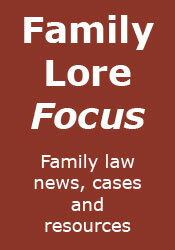 Whatever happened to... Family Law News?